It’s always nice to know where to find support. I’m pretty sure I’m exaggerating but I like the expression “Better safe than sorry”. Hi Petra, sounds like it is a bit slow going, but perhaps a good strategy as you say to leave some of the other stuff to your husband! I really do understand why stairs are so expensive. As an amateur (even though I have had an excelent adviser) there is new issues coming up all the time. If you are curious please feel free to take a look at my long term project. I’m not sure but eventually I work so slow just to avoid all the other work which my husband is doing. As replacing a door, put all the electricity inside the brickwalls, rising a new wall and even more. Nice to see the stair rising! 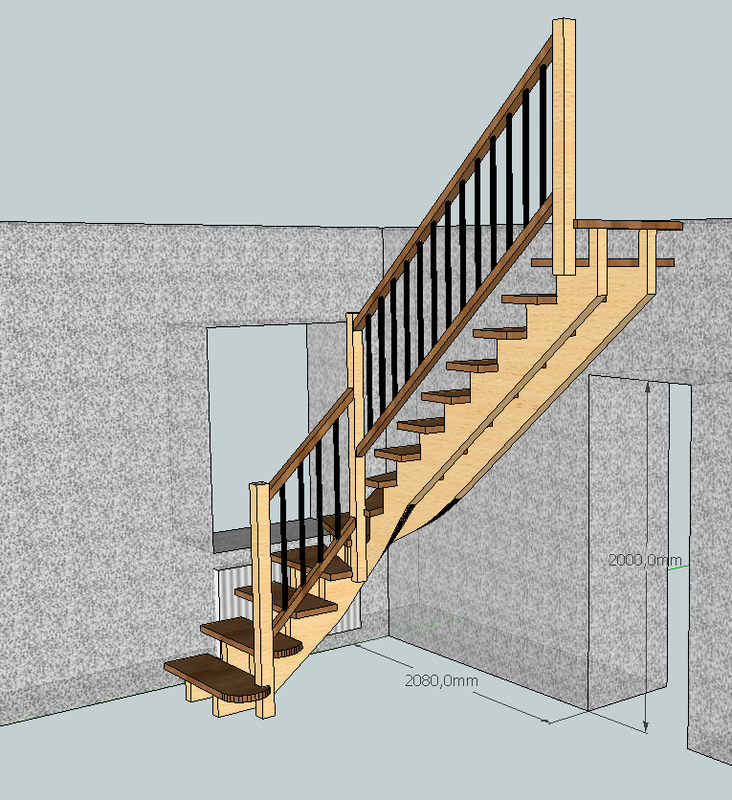 Great to see how your stair project is going. Thanks very much for sharing! After a long summer my stair project is alive agan. You stair risers look very solid! I cannot wait to see the outcome! See them now… I must not have been logged in. My bad! I’ll be sure to check that from now on. Nice to see the stair slowly growing! For Christopher I did post the last designs files you can see them from earlier on in this thread. Be sure to be logged in or they will not show up. 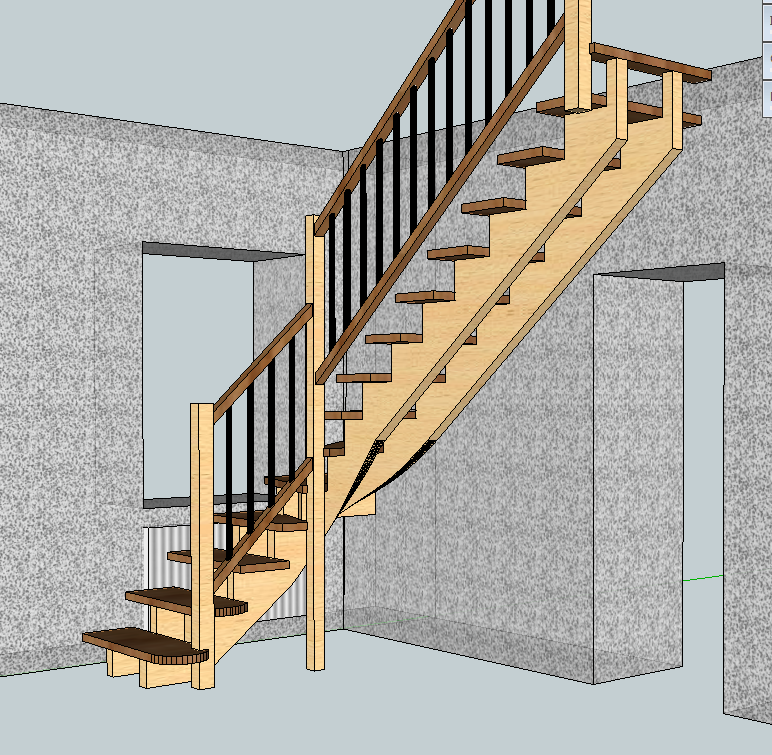 General specs were worked out on previous designs using StairDesigner and SketchUp. For those that might be interested in this I’ve uploaded a zip file with the design elements. Looking forwards to seeing the stair finished Petra. I believe you forgot to include your modified file such that Petra (and everyone else) can have a look.. Slowly, slowly our new stair is taking shape. 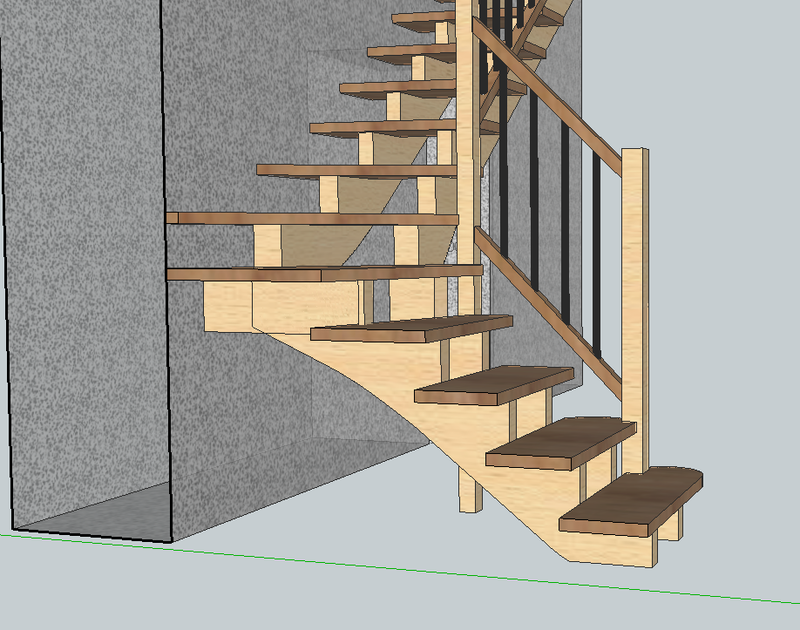 For all amatures like myself, I must say, with stairdesigner you get a possibility to build your own stair. Well I haven’t reached the goal yet but there is hope. Some photos are uploaded at my blog. I will try to open the dxf in my light verson of cad so I get all the measures. Is the pdf meant to be printed 1:1 and used as a fillsize template? The strings will be OK to build from 66×315 but as always with stairs with winders, you’ll have to glue extra width on the sections supporting the winders. 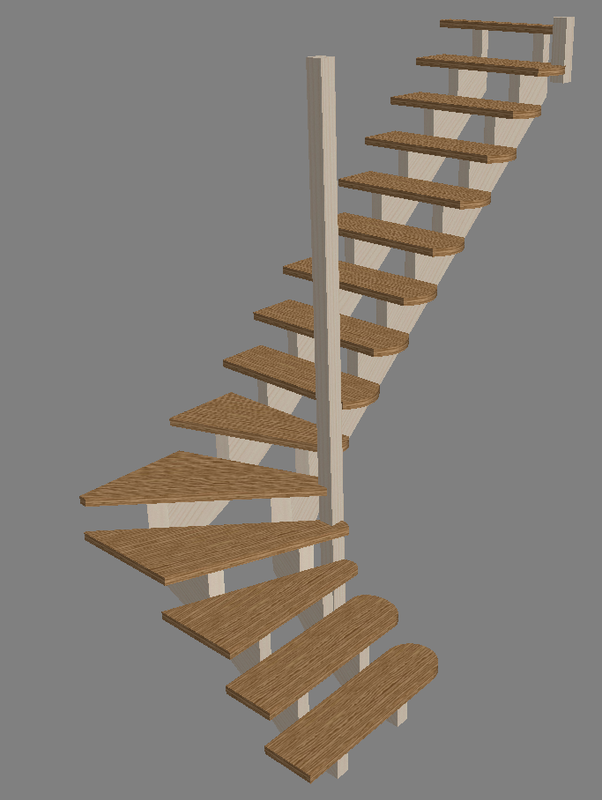 I attach the final StairDesigner files for your approval. Note that the shape of the stringers should be edited to make them flow better and easier to build. Can you upload your last design so I can have a last check? Are we still ok with 66×315 for the strings? Your stair looks fine like this . I have just adjusted a little the winders so that they are spread more evenly around the turning and move the last post forwards so that the last step nosing is not flush with the post face . If you are OK with this last design I can send you the manufacturing files. My height calculation wasn’t that bad Floor to floor it will be 2860mm. We will keep the beem in the celing almost as it is which means the hole will have a width of 760mm. So we keep the stair width at 800mm and adjust tha last step to fit between the wall and the beem. The newel post in the inner corner will be placed under the beem where it will be cut of to make the hole a bit L-shaped. I made the first flight a little shorter so there is less impact of the window and a not so many steps without handrail on the right side. The handrail for the right hand on second flight we will make when the stair is in place. And there will be a wallmounted handrail all the way up on left hand. I have rounded (again) the steps on right side and will use a tool for which I don’t know the english word to make a nice oldfashion shape on the front and right side of the steps. Without a handrail on the second flight your stair will be quite dangerous. On the other hand you could take away the first handrail. Making the stair wider is possible but 800m wide is already not bad for a normal stair. Be careful if you make the stair wider your stair well will also have to be wider! We’ll be waiting for the next installment! As you can see the stair stringer looking face on hardly covers the upper left corner of the door. This wouldn’t be an issue even if the stringer was against the wall. But looking at your photos, it will mean that the door will only open to 90°. Your design should work fine . Note that to stabilize the stair, you will need to anchor the end of steps 6 and 7 firmly on the wall. However the joint between the stringers will be taking a lot of strain and might with years begin to play. 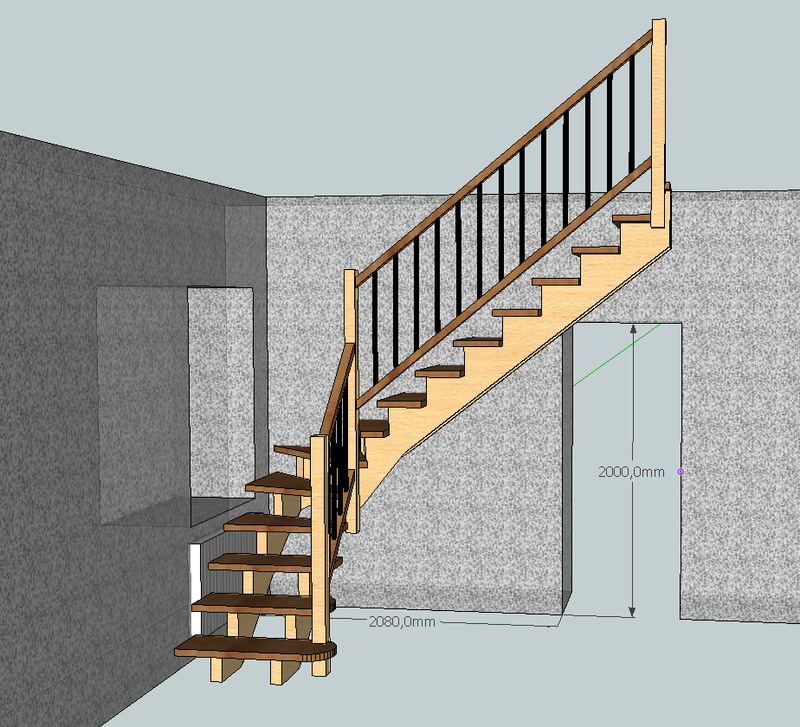 We cannot add this in StairDesigner so you’ll have to add it either by editing the DXF file or by hand on the PDF print outs. Note that you’ll need to edit a bit the shape of the cut strings so that they jon harmoniously. This will make the stair nearly free standing, only fixed at the start the end of the first stringer into the wall and at the first floor. The stair would be perfectly stable with no risk of play in time. I attach the SketchUp model .